This story ran in an old issue of Classic Motorsports. Want to make sure you’re reading all the latest stories? Subscribe now. Meet the BMW M Coupe. It’s more than a hardtop version of the M Roadster, which is itself a pumped-up Z3. The M Coupe follows a long line of three-door speciality BMW coupes built out of more common two-door models. Despite the silly nickname, you can call the M Coupe the spiritual successor to BMW rarities like the 2002 Touring and later 318ti. It also has its own cult following, and prices have been creeping up lately as a result. The M Coupe wasn’t always such a collectable, though. When it arrived on our shores for the 1999 season, its weird looks garnered more weird looks from consumers. Cars didn’t exactly scream off the lots. It wasn’t just the exterior’s fault, as the interior color choices also turned up noses. In some cases, leather highlights in the cabin matched the car’s exterior, meaning bright Evergreen paint was paired with bright Evergreen leather. Sometimes the colors downright clashed: According to the M Coupe Buyers Guide, two cars were sent here sporting Dakar Yellow paint along with orange and black interiors. The M Coupe’s MSRP hovered around $45,000, and only 2858 units were sold in North America through the end of the model’s run in 2002. Today high-mileage cars are trading in the teens, about what you’d expect to pay for an M3 from that era in similar condition. It’s the special cars that are bringing in more-like $50,000 and up. Special in this case means low mileage, no sunroof and the S54-spec engine found in the 2001–’02 cars. The 1999–2000 M Coupe received BMW’s S52-spec inline-six, the same 240-horsepower engine found in the E36-chassis M3. For 2001 and 2002, the North American cars got the same engine that BMW used in overseas markets, the S54-spec inline-six also found in the E46-chassis M3. While displacement remained 3.2 liters, variable valve timing and other tricks boosted output to 315 horsepower. All M Coupes received a five-speed manual box. No matter what the version-or color combo, for that matter-the M Coupe is a thrill to drive. Both engines are smooth, flexible and powerful, and the car feels tighter than its open-top siblings. Rennie Bryant manages Redline BMW Performance and has spent decades working with the marque. He has some advice for anyone shopping for a BMW M Coupe. As with any car, service reports are a big plus when shopping for an M Coupe. It’s also good to look for a car with some of the most common maintenance items covered: shocks, front lower control arm bushings and rear trailing arm bushings. The value of these cars has been climbing, which is a good sign. If you grab one now, they could prove to be a good investment. Parts availability is very good for these cars, so you could conceivably restore a rat into a nice car on a budget. As anyone who works with cars can tell you, it’s always easier to start with a known quantity. That’s why we typically suggest buying a low-mileage car with service records. The M Coupe is basically an E36-chassis M3 with a different body, except for one big difference: The rear suspension is actually more representative of an E30-chassis car. This rear suspension setup has its advantages and disadvantages. It doesn’t typically experience the subframe mount failure that E36 M3 owners worry about, but camber and toe settings cannot be adjusted-and the car is often considered a little twitchy in stock form, so adjustments would be beneficial. However, there are rear camber and toe kits available to solve this issue. As for the rest of the car, it’s largely bulletproof. VANOS [variable valve timing] issues are not uncommon, but you can combat this by making sure your engine oil is changed regularly. We’ve also seen a few troublesome oil leaks traced to the pressure-regulating valve. That’s not a commonly checked area, so give it a look if you have a pesky oil leak. Sometimes when the car has been running for a while (say an hour or so), the clutch flex line heats up and expands with pressure, making the car hard to get in gear. Replacing the stock line with a braided stainless-steel line solves this issue. Join Free Join our community to easily find more BMW articles. The looks are a personal judgement, but the handling tends to be loosey goosey compared to later M models. The cars that got the S54 engine bring a nice premium. If you value idiosyncratic appearance over crisp handling, these are a better choice than the later Z4Ms. Otherwise, not so much. 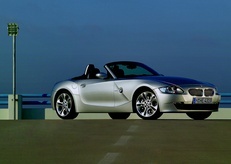 I think the Z3M coupe looks kind of cool, but I own a Z4M coupe.